Asian Elephant Shirley Turns 70 Years Old! While the average lifespan of captive elephants is 42 years for Asians and 47 years for Africans, The Sanctuary’s 11 resident elephants currently range in age from 35 to 70. July 6, 2018, The Elephant Sanctuary celebrates Asian elephant Shirley’s 70th birthday! While the average lifespan of captive elephants is 42 years for Asians and 47 years for Africans, The Sanctuary’s 11 resident elephants currently range in age from 35 to 70. The Elephant Sanctuary in Tennessee is now home to five elephants 50 and older. Sissy is 50; Minnie and Ronnie are 52; Billie is 55. Shirley has an incredible life story. Born in Sumatra in 1948, Shirley was captured from the wild and sold to a traveling circus, entertaining audiences for more than 20 years. In 1974, Shirley suffered a broken leg during an altercation with another elephant. As a result of her injury, in 1977, she was transferred to The Louisiana Purchase Zoo and Gardens, where she was the sole elephant resident for 22 years. As Shirley aged, the zoo staff decided she needed more space and the companionship of other elephants. Her primary caretaker, Solomon James, accompanied Shirley on her journey to The Elephant Sanctuary in Tennessee. Her arrival was captured by Argo Films and became part of the documentary, The Urban Elephant. At The Sanctuary, Shirley had an emotional reunion with another Asian elephant, Jenny—nearly bending the bars of their barn stalls to be near to one another. It was later discovered that the two performed together in the circus 24 years earlier. For the next seven years, Shirley and Jenny were inseparable in a relationship resembling one of a mother and daughter. The Urban Elephant documented Shirley and Jenny’s explorations together, including Shirley standing guard over Jenny as she took naps in the habitat. 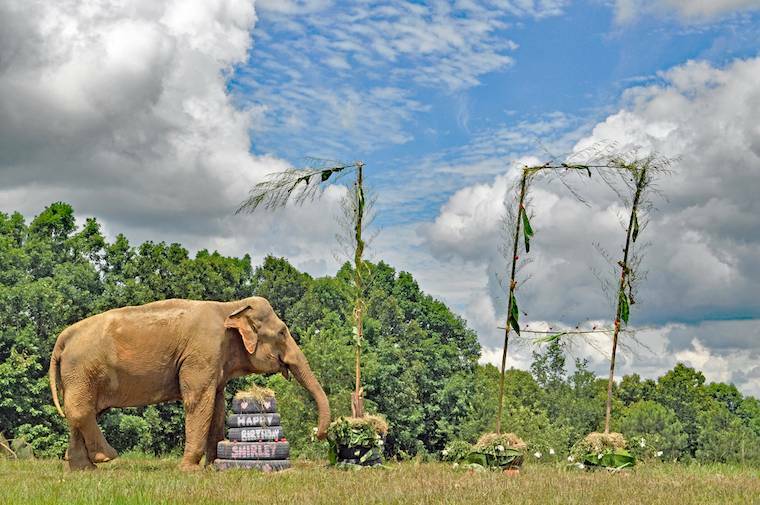 To celebrate Shirley’s milestone 70th birthday, Caregivers created an elephant-sized ‘70’ out of edible materials—bamboo, strung with fresh flowers and produce.